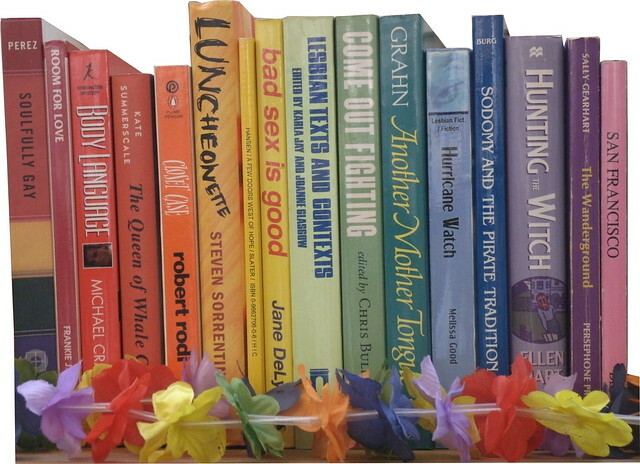 A “colorful” sampling of some of our LGBT-interest books. Capitol Hill Books has recently expanded our GLBT section with dozens of freshly-acquired books. The recent arrivals provide our store with a diversity of GLBT voices in variety of genres including fiction, mystery, sci-fi, memoir, essay, erotica and more. Our books range from a history of homosexual relations amongst pirates to a book on the religious beliefs of lesbians and gays to a fiction book about a lesbian superheroine. Capitol Hill has long been one of Denver’s most gay-friendly neighborhoods. And we here at Capitol Hill Books appreciate all of the LGBT customers we’ve had in our more than 30 years of business. This entry was posted in Uncategorized and tagged Bisexual, Capitol Hill, Capitol Hill Books, Community, Gays, Lesbians, LGBT, Trangendered, used books. Bookmark the permalink. ← Time for Summer Reading!